Large specimens from Tennessee on display in the Headen Center atrium, in front of the NMBG Publications Store. In 2015, the New Mexico Bureau of Geology moved to a new, three-story, 85,000 sq. foot facility named the Headen Center. The Mineral Museum and Publications Store can be found on the first floor atrium, where large minerals and ‘touch and feel’ specimens are aesthetically displayed. A variety of colorful minerals on exhibit in the Americas Display case. Mineral exhibits in the museum concentrate mainly on New Mexico, but also include specimens from around the world. Minerals from e ight important New Mexico mining districts and areas ( Organ, Santa Rita and Tyrone, Fierro-Hanover, Hansonburg, Magdalena, Old and New Placers, NM Pegmatites, and NM Uranium districts) highlight important minerals from each location. All casework in the new facility is composed of glass, stainless steel, painted maple, and white oak. Four standup cases dominate the interior, with smaller cases lining the outer walls of the gallery. The ultraviolet collection lies behind the Dana reference collection in a small, walk-through hallway without any doors or shades. Lighting for the cases consists of full-spectrum LEDs. The cases can accommodate additional lighting, with additional electrical hookup built in. An open area spans the middle of the gallery to accommodate additional displays for the future. Sales cases are maintained in the entry so that the visitor may bring a mineral treasure home. All proceeds from mineral sales & monetary donations are used for the purchase of new museum material. In addition to the displays, the museum offers a large reference collection for scientific use. The reference collection is housed on the museum’s second floor and is available to all interested persons (an appointment should be made with the museum director before its use). The museum also has two lab facilities: 1) A "dirty" lab contains saws, polishers, a fume hood, and rock crushing/splitting equipment, and 2) a "clean" lab that houses petrographic microscopes, photographic equipment, and other preparation materials. The museum also offers traveling exhibits and its personnel provide educational programs to amateurs and professionals alike. New Mexico quartz specimens on display at the March 2016 Albuquerque Gem Show. The Augmented Reality Topographic Sandbox and a mineral product demonstration set up in the museum classroom. A classroom, located on the second floor of the museum, is used for outreach events and educational demonstrations. Students can learn about fossils, mineral products, rocks, and topographic maps using an interactive topographic sandbox. Reservations to use the classroom must be made in advance. A little over one hundred years ago the New Mexico Territorial Legislature established the New Mexico School of Mines (now Institute of Mining and Technology). The charge to the school was to provide for higher education in the earth and related sciences. 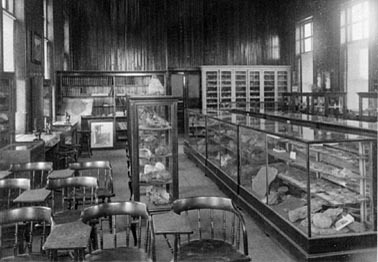 The school's board of trustees (now "Regents") was assigned the responsibility of prescribing the various courses of study, of equipping laboratories and classrooms in a manner appropriate for instruction, and of assembling (for educational purposes) a geological and mineralogical cabinet. 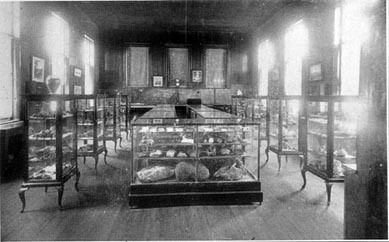 President Fayette A. Jones carefully selected and acquired many specimens during his travels for the fledgling school and to him must go the credit for creating, in 1899, the first collection. With little or no fanfare, Socorro's first museum of any kind was born. Nurtured by dozens of earth scientists over the years, the collection has steadily evolved through prosperity and depression, fame and tragedy, to a superb assemblage of over 15,000 pieces today. The museum is maintained by the New Mexico Bureau of Geology and Mineral Resources and its staff routinely draws upon this mineralogical legacy to participate in educational events and gem and mineral shows throughout New Mexico and the United States. In addition, the collection provides ongoing aesthetic, scientific, and research benefits for all of society. One great story that incorporates history and minerals with some key players is the story of St. Patrick's Day. Read more about C.T. Brown's Smithsonite and the NM Tech St. Patrick's Day Celebration. Eveleth, R.W. and Lueth, V.W., 1997, A Rocky History: The first one hundred years of the Mineral Museum in New Mexico, USA: New Mexico Geology, v. 19, p. 65-75.